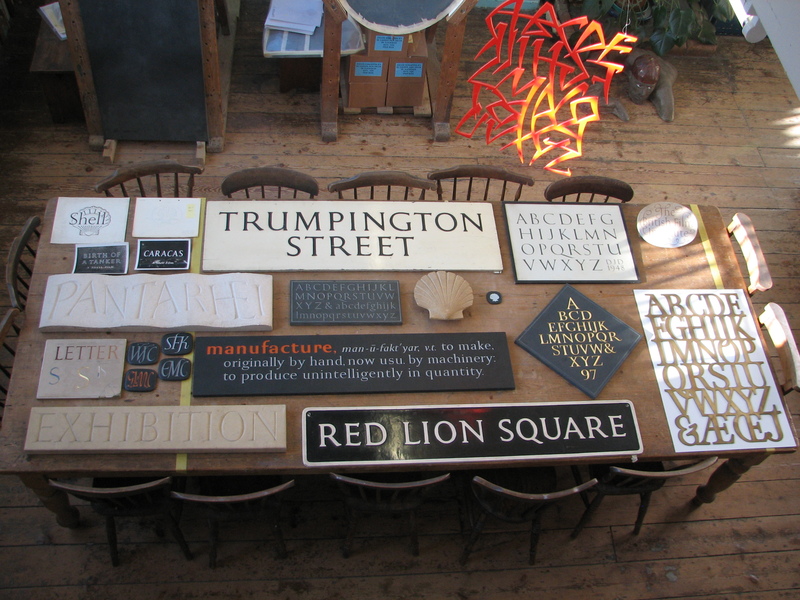 I happened to be waiting in Exhibition Road to go into the Victoria and Albert Museum many years ago, and noticed the letter-cut sign on the wall. The more I looked at it, the more intrigued I was. The lettering looked so perfect and so even; it was cut over two blocks of stone, and yet no letter was actually on the join. 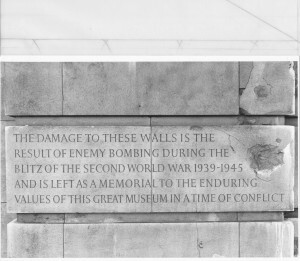 In addition, the steady diagonal on the right-hand side almost drew in to the lettering the obvious bomb damage. 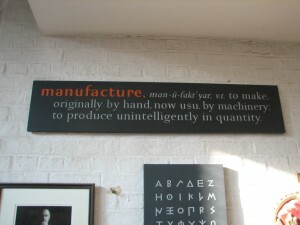 It seemed a supreme example of craftsmanship. 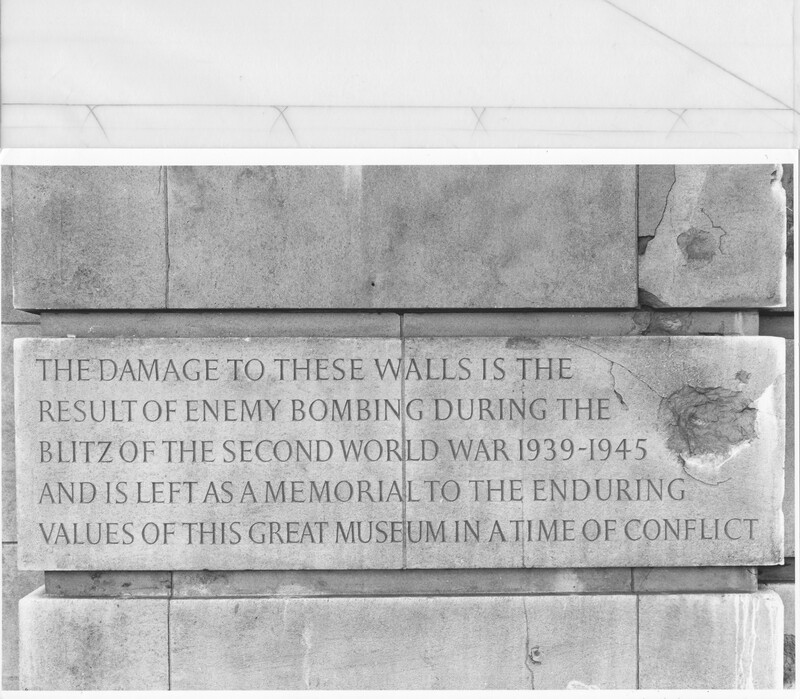 I learned later when talking with David that, when he was approached to cut the inscription noting that the damage to the building was as a result of air raids, he was asked what sort of stone he wanted to cut the lettering on for it to be attached to the building; his reply was that there was perfectly good stone already on the walls! 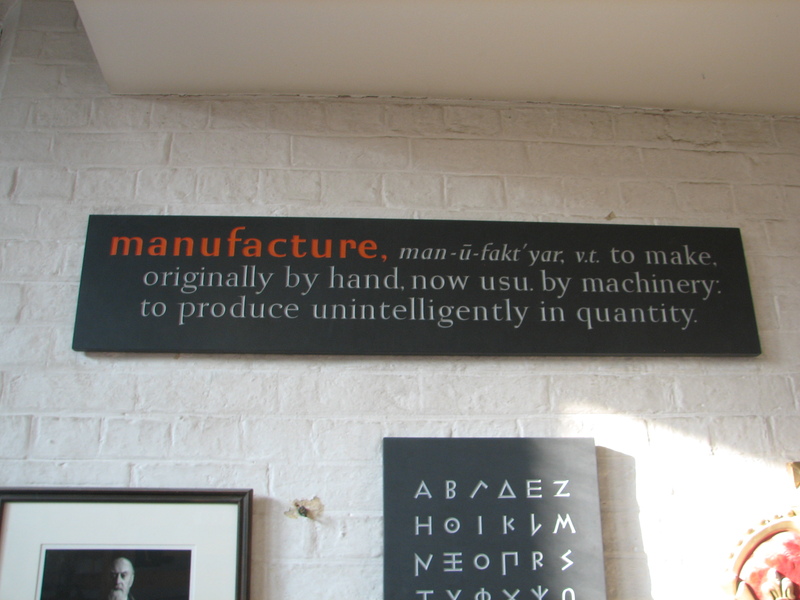 David’s lettering was exceptional, his eye for design, and particularly spacing quite phenomenal (one of his quotes was on the lines of a bad space is worse than a bad letter). This year, 2015, celebrates his centenary and there are a number of events planned. For details see the Cardozo-Kindersley workshop website here. One major event is the exhibition at the Fitzwilliam Museum; this is on from 21st April to 14th June and coincides with more of David’s work at Kettles Yard, both in Cambridge. If you haven’t been to either then both are worth a visit on their own, but take in David’s exhibitions while you’re there! 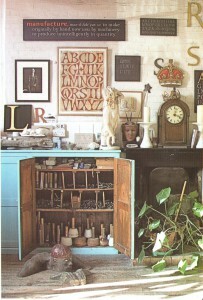 His inventiveness and skill are shown here in a picture from the wall in the Cardozo Kindersley workshop – examples of lettering of various styles and designs, and beneath that a cupboard with the tools of the trade. 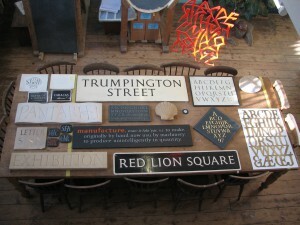 David learned letter cutting with Eric Gill when the latter was based at Pigotts in High Wycombe in December 1934 starting when David was 19. His father, it was said, liked to do things properly, and so he paid for David to be apprenticed. Whilst with Gill, David worked on many important commissions. 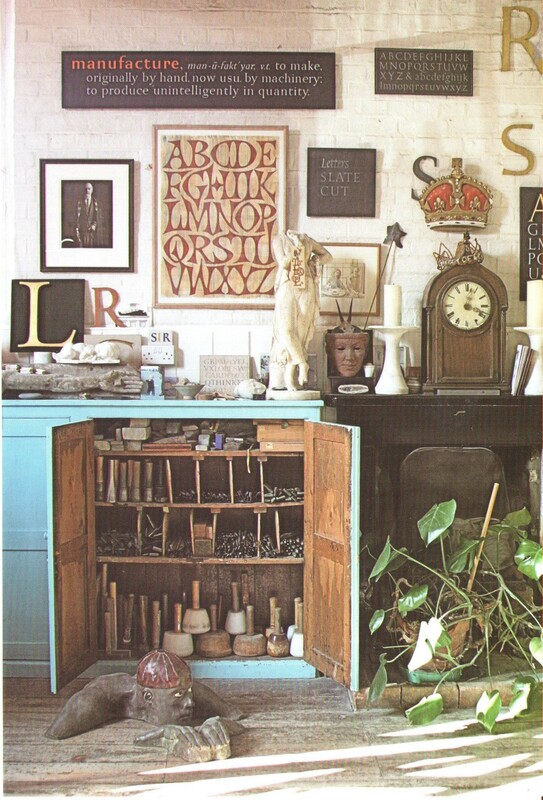 When Gill died in 1940, David was asked to take over the workshop, but once he had sorted out Gill’s affairs, he set up his own workshop at Dales Barn in Barton. David was a leading figure in setting up the Crafts Council and became Chair, stepping down because of concerns of underfunding (’twas ever thus!). 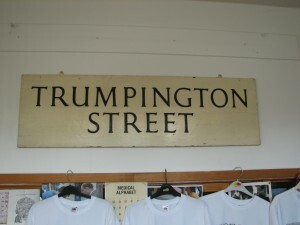 David’s lettering for the Ministry of Transport was widely praised, but in the end they chose a lower case monoline style for motorway signs. 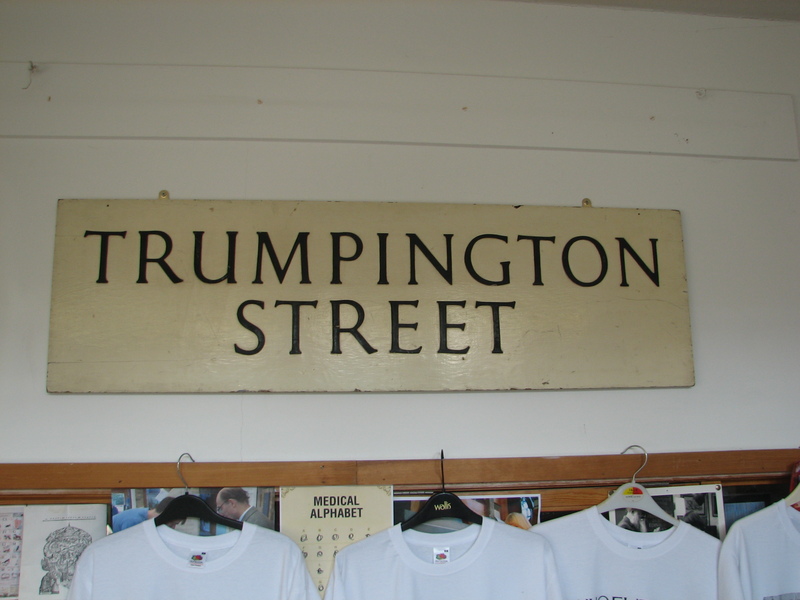 Yet his clear and readable letters are still seen throughout Cambridge and in other towns and cities which have an eye for good design! 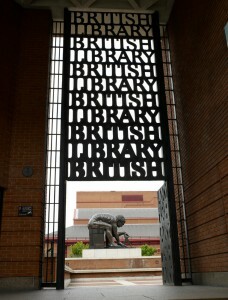 Many commissions flowed from the workshop in Barton and when it was moved into a converted infants’ school in Cambridge itself, not least the magnificent gates for the British Library, designed by David and his third wife, Lida. They are a fitting addition to a remarkable building. The workshop is currently preparing for the exhibitions and centenary events and here is a selection of David’s work being considered for inclusion. Again it shows just how versatile and talented he was. 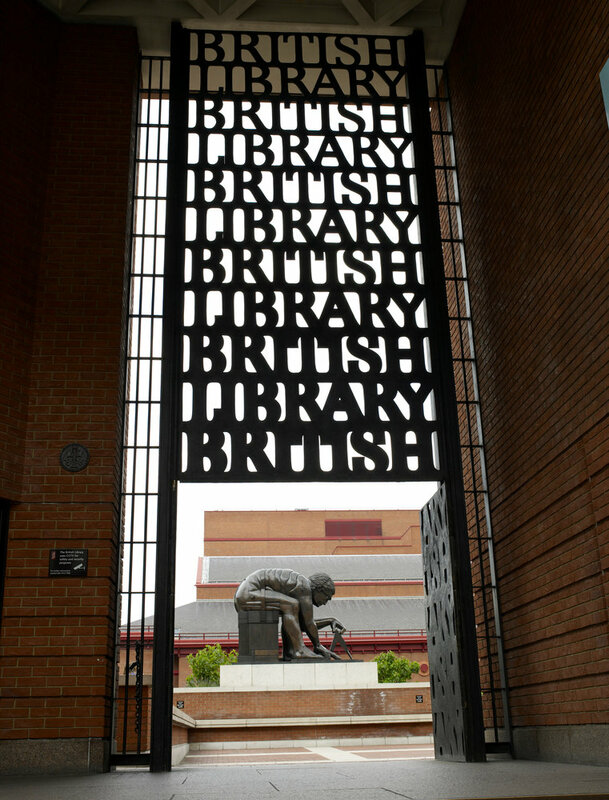 There is not only the exhibitions but also an evening at the British Library with Tanya Harrod, Fiona MacCarthy and Lida and Hallam Kindersley on Friday 12th June (tickets here). The London exhibition is at the Patrick Bourne Gallery on 15th June, with pieces of David’s work for sale alongside new pieces by the workshop. Then the Centenary Walk is previewed here, and also a wonderful set of playing cards with David’s work featured on the backs of the cards – a delightful video shown here. All in all a great way to celebrate the life and work of such a wonderful man, a true Alphabetician! This entry was posted in Blog, Exhibitions and tagged British Library, Cambridge, David Kindersley, David Kindersley Centenary, Fiona MacCarthy, Fitzwilliam Museum, Hallam Kindersley, Kettles Yard, letter cutting, Lida Kindersley, Tanya Harrod, The Cardozo-Kindersley Workshop, The V&A, The Victoria and Albert Museum on 13 April 2015 by Patricia.